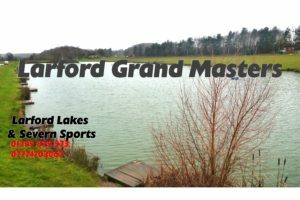 36 anglers turned out in freezing cold condition, both the Match Lake and Specimen Lake were frozen first thing followed by ice cold rain all day. Winner on the day was Chris Senter (Shakespeare) who drew peg 62 on the Specimen Lake. Chris had an early carp on Method and later switched to long pole landing bream to soft pellets. 2nd on the day was Andy Fullylove (Preston) who drew peg 24 on the Arena Lake. 5th on the day was Jamie Harrison (Matrix Bait -Tec) who drew peg 66 on the Specimen Lake landing 26-04-00 to open end feeder. All Jamie’s fish were bream. 6th on the day was Phil Briscoe (Larford) who drew peg 46 on the Match Lake. Phil caught 2 early carp to Method and later switched to waggler to catch 25-07-00 of bream. Chris Senter, Andy Fullylove, Chris Shepherd, Jamie Harrison & Phil Briscoe all qualify for the Grand Master final. Chris Shepherd also qualifies for the Larford Classic final too.